At a conference which takes place at LMU from March 1st to 3rd, researchers from around the world will discuss the latest insights into the evolution of various types of cancers and their implications for therapy. 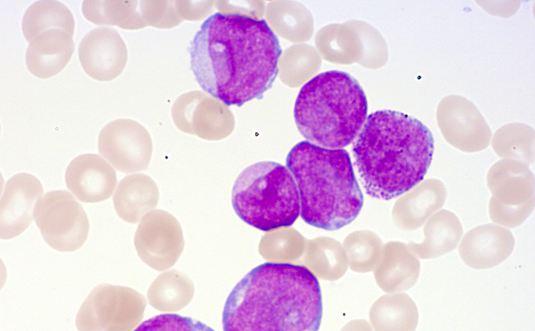 Peripheral blood smear showing immature blast cells with cytoplasmic granules, indicative of acute myeloid leukemia (AML). Source: Leukemia Diagnostics Laboratory, LMU Medical Center. Although significant advances have been made in the treatment of many types of cancer, malignancies remain life-threatening diseases. The prospects for effective treatment vary widely between different classes of tumors, and even after initially successful therapy, the risk of relapse is considerable. The Collaborative Research Center (SFB) on Cancer Evolution: Genetic and Epigenetic Evolution of Hematopoietic Neoplasm was established at LMU with funding from the Deutsche Forschungsgemeinschaft in 2016. Its mission is to explore how tumors can recur, and to uncover the molecular mechanisms responsible for the emergence of tumor cells that are resistant to virtually every weapon in the oncologist’s arsenal. The Munich research consortium focuses on understanding the evolution of cancer cells. These cells proliferate rapidly and display high rates of mutation, and are expected to provide novel insights into evolutionary processes at the cellular level: “We can learn a great deal from these tumor cells about how cancers evolve and use this knowledge to develop new approaches to therapy that provide sustained long-term treatment,” explains Professor Heinrich Leonhardt, the Speaker of the SFB. In order to dissect the mechanisms that drive cancer progression, drug resistance and relapse at the molecular level, biologists, chemists, clinical scientists and specialists in bioinformatics work in close cooperation. Their efforts are centered primarily on two types of blood-cell cancers, acute myeloid leukemia and indolent lymphoma. Technologies that have emerged in recent years have opened up new opportunities and have already yielded novel insights into cancer evolution. For example, it is now possible, with the help of model systems and the use of the latest methods for DNA and RNA sequencing (‘next generation sequencing’), to obtain the genetic fingerprints of single cells. These techniques enable researchers to monitor the genetic differentiation of tumor cells in response to treatment and thus allow them to investigate how drug resistances emerge. The latest insights into the evolution of diverse types of tumor will be presented, and their implications discussed at an international symposium to be held at LMU on March 1-3, 2018. The conference has been organized by members of the Munich-based SFB. Two leaders in the area of cancer evolution – Peter Campbell from the Wellcome Sanger Institute in Hinxton near Cambridge (UK) and Catherine J. Wu from the Dana-Farber Cancer Institute in Boston – will review the present state of the field in their plenary lectures with which the conference opens. The two plenary lectures are open to the public, and no pre-registration is required.